Wes Simpson who works with HauteSpot as the Director of Business Development on the East Coast, among many other things he does, will be presenting at the Video Services Forum annual VidTrans conference this Wednesday, February 2nd. The conference is being held at the Marriott Hotel in Marina Del Rey and Wes' presentation will begin at 1:15pm. Wes asked me to help him with his topic "Transmitting Live Video on 3G: Will the Mobile Phone Network Work for Contribution?". I was only too happy to help repay Wes for all the help he has given me over the years. Broadcast video is looking for alternatives to the incredible costs they incur for electronic news gathering or live remotes. With the advent of 4G wireless services and much better compression like H.264, coupled with low cost HD cameras that are capable of streaming using IP, broadcasters are starting to become interested in using these services to reduce their production costs. We actually started HauteSpot back in 2005 with this application in mind. Unfortunately we were about 6 years too early to market. Broadcasters were not ready to abandon their SDI and microwave based systems for "risky and unproven" IP technology. But as budgets tighten and competition intensifies, the motivating factors to consider alternatives grows. Our recently developed eWRAP product which we are OEMing to Global Emergency Resources, is an ideal platform for this new IP wireless adoption in broadcasting. It is flexible, designed for video, is easy to use, and is low cost compared to the alternatives. Combine this with some new products that we will be announcing at ISC West for wireless recording for store and forward, and we finally may see the broadcast industry starting to adopt our technology. If you are in the Los Angeles area, you might want to stop in to see Wes' presentation. I will try to get a copy of it to post after the show. 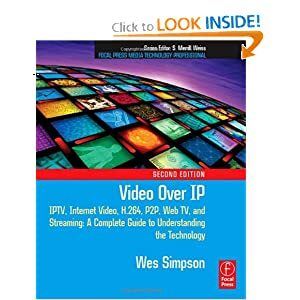 Oh, and BTW, Wes is an accomplished author with several books out on Video Over IP. Check them out on Amazon.